September 11, 2001. That’s a date that generally evokes a shudder from many both here and abroad. Many Americans remember with extreme clarity where they were when they heard about the attacks, and at the time felt powerless to do anything other than watch or listen in horror as the tragic events unfolded, hoping that it was all a bad dream. 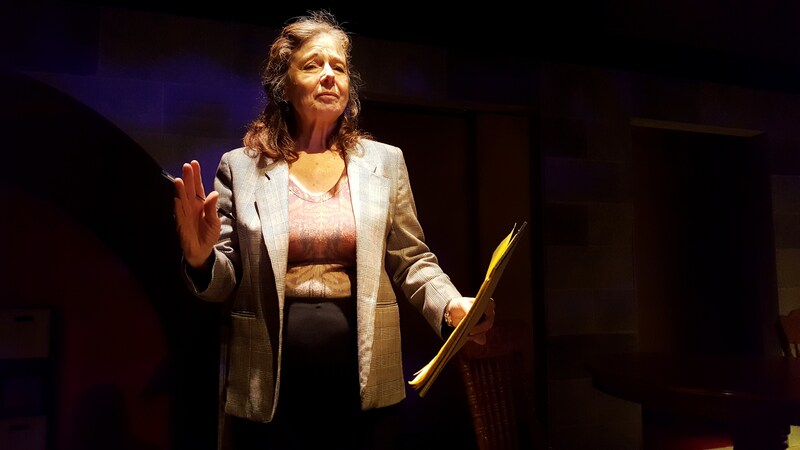 The Pear presents Anne Nelson’s play, The Guys, in a run that includes the 15th anniversary of 9/11. Nelson wrote the piece in only nine days during the fall of 2001, describing a very personal account of two people who would have otherwise never met but for the tragic events that threw them together. Joan (Diane Tasca) is an editor who receives an urgent call to help Nick (Ray Renati), an FDNY captain, write eulogies for the men he lost when the Twin Towers collapsed that fateful day. Joan muses that she cannot remember the last time she’d heard that somebody needed a writer, but she’s game to help. The story takes place in Joan’s living room as the two come together to tackle the task at hand. At first, Joan is kind, calm, professional, though somewhat detached. Nick is distraught, burdened with what he sees as an insurmountable assignment. And then they talk. Director Christian Haines keeps the staging simple. Although most of the action takes place at, or near the center stage table, Tasca moves downstage right to deliver four lengthy monologues along with several shorter insights at different points during the play aided by light shifts (designed by Joseph Hidde) to focus audience attention. This way, she provides both context and her character’s inner thoughts about the events and their relationship to her and those around her. Both in her dialog with Renati and in the monologues we watch her character transform as she absorbs Nick’s pain and his admiration. Renati also moves downstage at times, as Nick tells stories about his men. He too transforms throughout the play. At first, Nick is a wreck, destroyed by the knowledge that he survived, and so many of his men did not. He feels for all of them as he struggles to remember things about their lives as people beyond the firefighters he knew at work. With Joan’s encouragement, Nick’s recollections give him strength. The second monologue really hits home. In it, Joan talks of a pebble being dropped into the water at Ground Zero and where someone might be with respect to that pebble and the ripples stemming from it. If a person was at Ground Zero, they are next to the pebble, and if they survived the ordeal uninjured, they are, subjectively, OK. Then she goes on to talk about the ripples from the pebble, and how one might be affected by them. The first ripple is one’s family. Were any of them at Ground Zero? If not, explore the second ripple, one’s friends. Were any of them at Ground Zero? And she keeps going. Each ripple is a little further removed, but still connected. Tasca is intense, though the monologues are not action oriented. They are instead thought provoking. In the discussions between Joan and Nick, we understand that everyone has a role to play in the healing. Nick, must help the families by delivering eulogies for his men. He talks of their personalities, and of what he and the others thought of them. He talks of their tools. His men were men of action. They helped people, but through his discussion, he also makes Joan realize that she too has tools, powerful tools in her words. Her way with words helps others heal. Her words help him heal – or rather, her rearrangements of his words help him understand the depth of feeling he always has for his men, and by extension, their families, friends, and the people they’ve all helped. The story is emotional and cathartic. 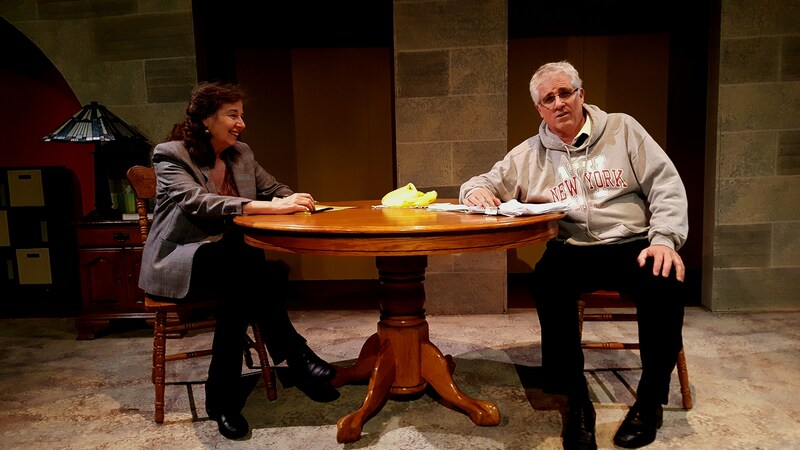 It explores the grief process in a very empathetic way, and Tasca and Renati embody Joan and Nick beautifully. There is also a sprinkling of humor injected to lighten a few of the darker moments of the story. Both actors seamlessly traverse the emotional arcs, fully in character, making us see Joan and Nick very realistically. We feel for them. We share their concerns, and we admire their strength. 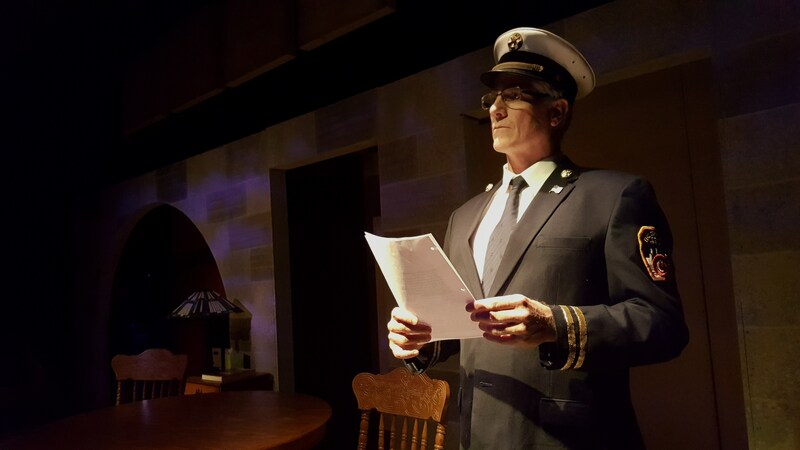 Ron Gasparinetti’s scenic design is simple, and functional as it serves both The Guys and another play in repertory rotation (more on that later). Several arches stand upstage giving the room some depth. A table and two chairs are center stage where most of the action takes place. There are several decorative screens that hang above the arches, and in this play, they are merely upper wall décor. There is one bit of staging that could be improved. During the final scene, Joan again shares her inner thoughts with the audience while Nick leaves momentarily. Unfortunately, rather than fully leaving the stage, Renati merely hides behind a portion of an upstage arch to execute a quick change that should have been completely out of view. Alas, in the intimate Pear space, his actions pull focus from Tasca’s impassioned delivery for some in the audience. The Guys will make you remember the events of 9/11, but the gore is neither included, nor the point of the story. The message is one of hope. It’s one of remembrance. It’s one that reminds us that we all have our contributions to make, and that the ripples touch us all in some way. Don’t miss this powerful production. The Pear is doing something a little different this time. The Guys is being presented in a repertory rotation with another emotionally charged, two-person play entitled Veils, by Tom Coash. The full performance schedule is listed on The Pear’s website. Although the bulk of the rotation alternates between the two plays, since September 11, 2016 falls within the run, The Guys will be performed twice that day in remembrance of the 15th anniversary of the events.